Discussion in 'Guitars in General' started by dan7_69, Jan 30, 2012. Anyone played one of these? They look great, but I wanted to see if anyone had any experience with them. I figure, with a good setup, pickup swap, electronics upgrade, it would be a great guitar. I really like the idea of a Bigsby on this type of guitar, but wanted to see if anyone had any thoughts before I pulled the trigger. It also says the fretboard is Ebony, which I'm a fan of. 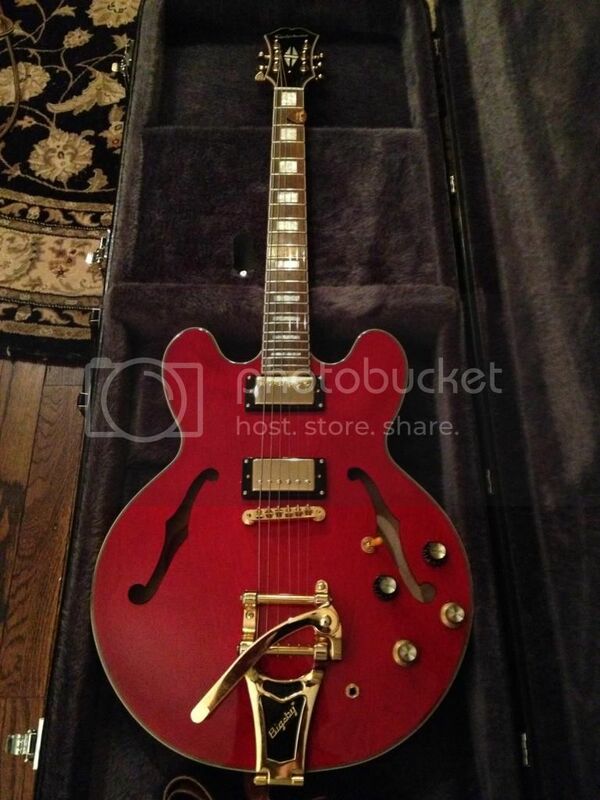 On that note, I could buy a used Epi Sheraton or Dot, slap on a Bigsby and have the same guitar for cheaper, right? I'd rather buy used, but don't seem to see any of these for sale. Any help is appreciated. Seems pretty silly to me. The 355 is the top of the Gibson thinline, semi-solid line; so to take that, then "Epiphone-ize" it? It seems commensurate to "Hey, here's Yugo's version of the Cadillac!" The Epi 355 is a good looking guitar, I bet is plays well and sounds pretty good too. However, this thread is most probably going to end up as an Epis are crap, Gibsons are crap thread. That is the way these things go. I'm only asking if anyone has played it, and their thoughts. I'm mainly wanting to justify the additional costs over taking a dot or sheraton and setting those up with a Bigsby. If someone feels the need to post based on speculation, or thoughts, without having played it, I don't really see the need for them to post, as that helps me zero. Please just keep it on track, and there won't be that issue. No stores locally have the guitar in stock, so I can't try it out. I'd be ordering, and could return if it wasn't good, but I'm just looking for opinions. I checked one out, along with the 345 and the 339. The 355 and 345 had quite a few noticeable finish issues. Just sloppy work in general. They both sounded great though. I bought the 345 but ended up selling it eventually in order to take a chance on a 339. The 339 ended up basically perfect, which frankly surprised me. I expected some finish flaws and uber-high action. The action was middle-high, but fixed without a truss-rod tweak. No finish issues at all thankfully. Hopefully that helps. The thing about the 355 though, is Musicians Friend will give you a free hardshell case with it right now, so it may be worth taking a chance. Just picked one of these up used the other day. Tweaked the truss rod, lowered the bridge, adjusted the pickups and wow! Sounds and plays great! Mine is from the later run with the rosewood fretboard; not ebony. The Epiphone Classic Alnico pickups sound great in this ax. I've had a Sheraton II and 58 Korina V reissue (still have it) in which the stock PUs were muddy and undefined disasters. Epiphone have definitely done some improvements with their newer guitars in the Chinese factory because these sound great as is. I'm even leaving the electronics untouched for now. I took out the V with the upgraded electronics and Gibson 57 Classics and compared it with the 355. Notwithstanding the difference in the body styles, the Epi CAs kept right up - I may even like them better! The final jury is still out, but will wonders never cease? Anyway, here's a pic. I'm loving this guitar! My beef is that it's a "The same only cheaper" knock off of the 355. If you want Bling in a lower cost Epiphone package consider the Sheraton II. It's been around since the '60s as the Sheraton. Add a Bigsby and you're there. Nice peghead inlay too. Yeah, as I stated I had a Sheraton II. Nice guitar but heavy! Upper fret access was really limited. I couldn't really get past the 15th position without severe limitations. Probably why there are no fretboard inlays past the 15th fret! I can get up to the 17th position on the 355. The 355s are out of production so the Sheratons are a much easier acquisition. I played a white one yesterday. I really loved the looks and really wanted to get one. It did sound great, and it played okay. The fret work was pretty well done, only a couple of sharp ends higher up on the fretboard. My main concern was the finish job. There were blemishes and the work around the f holes were shoddy. Otherwise it did sound quite nice. Guitar is heavy, at least to me compared to my ltd ec-1000 ctm. Although with the issues with the one I could find, didn't warrant the price in my opinion. i have an epi 335 pro, which is pretty similar but without the gold and the bigsby and i really love. i play it more than any other my other guitars (gibson and fenders). i did change out the pups and electronics on it and it turned a good guitar into a great one. I was in the market for a semi-hollow recently, and the GC near me had a white Epi 355. I tried that along with a couple of Dots, a Sheraton 1962 reissue, a couple Sheraton IIs, a Schechter Corsair, and a couple of Casinos. The best of the bunch was a stock cherry finish Indonesian-made Dot. I'm not a fan of gold hardware, so that may have influenced me, but I thought the Dot sounded the best and the reissue Sheraton was close behind. I did like the vibrato on the Sheraton so I may eventually put a Bigsby on the Dot, but I don't think it needs one right now. The action was a little high from the factory, but I did a full setup and it's dialed in really well now. Plays and sounds great. I had a Korean-made Dot several years ago that I sold, and it was also a great guitar. I think if you aren't afraid to take the time to make adjustments the Epis can be an excellent deal. The main thing is to try as many as you can so you can find the best one to start from. I remember playing a white one at GC that had the same finish issues, especially in the f holes. Sounded great though, and had an ebony board. My red one pictured above has some of the cherry finish seeping onto the binding at the neck joint on both sides. Not enough to keep me away, though. No problems with the f holes at all, either. Oh, and the fret work is fantastic all the way up the neck. No sharp ends, and nice and level the entire ride. Every note rings true. And I LOVE the split diamond on the headstock!